At the recent IPv6 Enablers conference held in Edinburgh last week, BT announced that they will be rolling out IPv6 to broadband users in 2015. In 2013, BT trialled the use of Carrier Grade NAT (CGN) as a possible approach to extending the life of the IPv4 Internet. BT found the problems associated with CGN made it an unacceptable solution. As a result, BT is now committed to deploying IPv6 which is the only long term solution to the IPv4 address exhaustion problem. This is extremely important news for IPv6 adoption in the UK. Today many of the world’s top Internet sites and Content Providers are IPv6 enabled as are all the main carriers. In many cases all that hinders the use of IPv6 is the last mile to the End User being IPv6 enabled. In the UK, the deployment of IPv6 by BT and the other ISPs will eliminate this obstruction to the widespread use of IPv6. In other parts of the world where End Users have IPv6, it is common today for 50% of the End Users’ traffic to be carried over IPv6. This figure was 35% in 2013, demonstrating the rapid growth in the number of IPv6 enabled services on the Internet. Erion is the world’s leading IPv6 training company and a leading provider of IPv6 consultancy. Erion has been providing IPv6 services since 1998. Our customers include many of the world’s leading technology companies, global enterprises, government organisations and standards bodies. At last week’s IPv6 Future Enablers conference, Erion’s Dr. David Holder gave a presentation on the Implications of Carrier Grade NAT (CGN). This presentation was a brief summary of the findings of the CGN Study that he undertook in 2013 for Ofcom, the UK’s telecommunications regulator. The presentation is now uploaded to Erion’s web-site and can be found here. 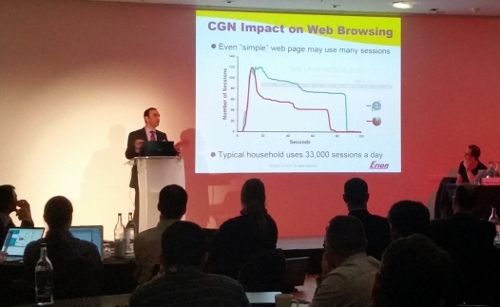 In the Study, David Holder predicted that the downsides of CGN would lead to an increased adoption of IPv6. At the conference this was widely confirmed by fixed line and mobile service providers alike. All agreed that CGN is something to avoid and that IPv6 presents the only realistic long term solution to the IPv4 address exhaustion. Furthermore, all were agreed that IPv6 should be used to bypass the limitations of CGN. At the conference, BT’s IPv6 Programme Director, Stuart Smith announced that BT intend to enable IPv6 for broadband users in 2015. 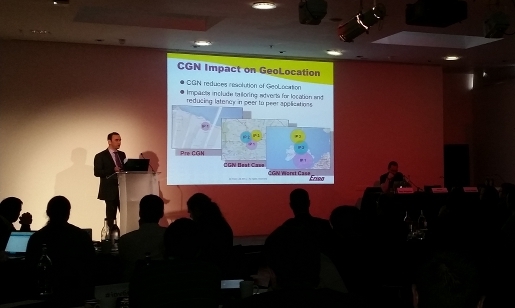 He said that this was in part due to the limitations of CGN which BT trialled in 2013. 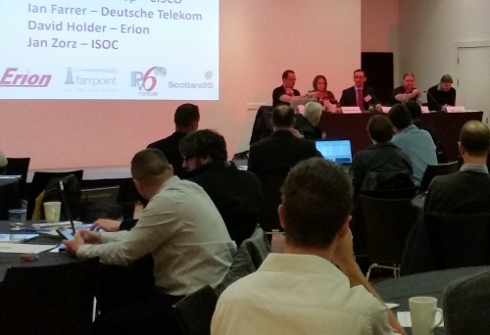 Last week saw the first IPv6 Future Enabler Conference in Edinburgh UK. The one day event had a very full schedule with speakers from, Erion, Cisco, EE, RIPE, Sony, IPv6 Forum, Go6 and Deutsche Telekom AG. All the presentations highlighted a number of common key messages. These included the reality that IPv6 is already widely deployed, the fact that the problems of CGN are likely to drive even greater adoption of IPv6 and that today IPv6 enabled End Users find that over 50% of their traffic is over IPv6. A highlight during the conference was when BT’s Stuart Smith (BT’s Director of IPv6 Programme) announced from the floor that BT intend to deploy IPv6 to broadband users in 2015. The reason that he gave for BT’s move to deploy IPv6 was the need to avoid the serious problems of CGN which BT trialled in 2013. This is closely linked to the CGN report published by Ofcom in 2013 for which the lead technical author was Erion’s David Holder. Overall the conference reflected a very exciting time for IPv6 generally and specifically in the UK. The news for the UK is particularly good where after many years of lagging behind the rest of the world by almost any meaningful metric we can now look forward to quickly catching up. The IPv6 Future Enabler was sponsored by Erion, the world’s leading IPv6 Training company. You are currently browsing the Erion IPv6 Blog weblog archives for November, 2014.